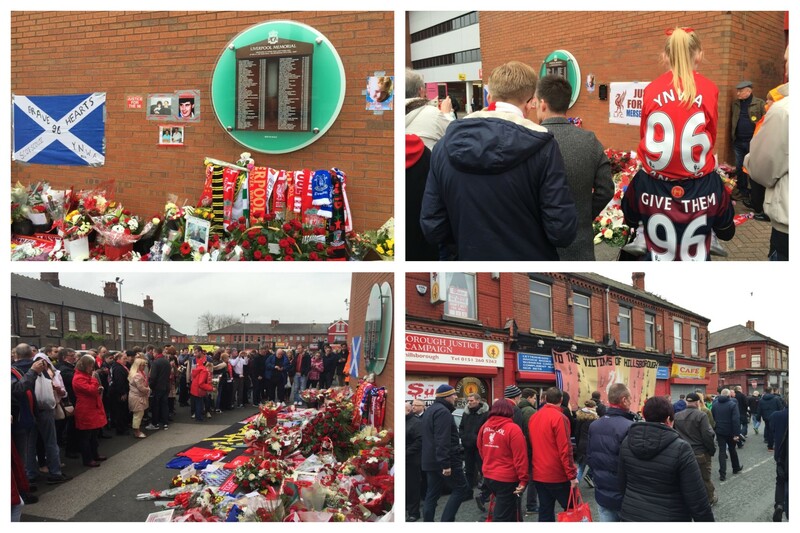 For 26 years the people of Liverpool have gathered at Anfield to pay their respects to the 96 fans who tragically lost their lives on an April afternoon in 1989. 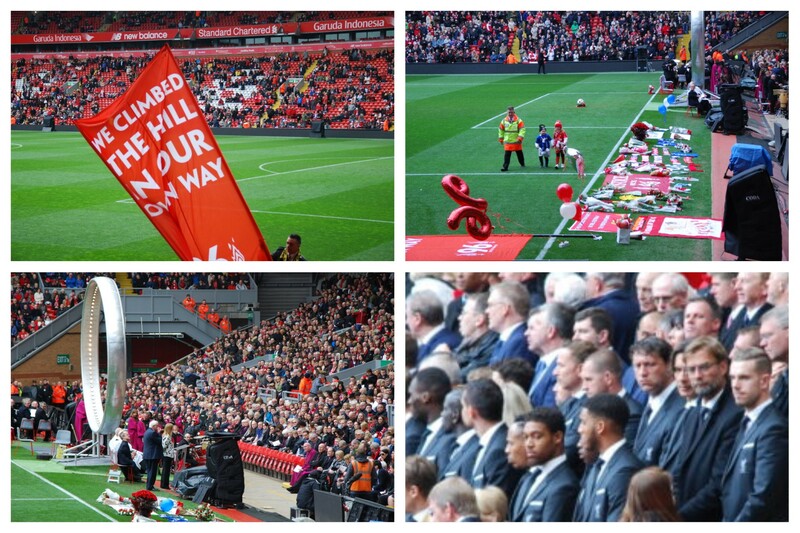 Today, on the Hillsborough disaster’s 27th anniversary, they did so for the last time. 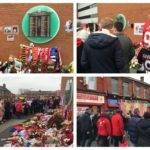 The Hillsborough Family Support Group (HFSG) took the decision to bring an end to the memorial services earlier this year, with the families stating that the time had come to draw a line under the annual event now that the new inquests are reaching a conclusion. Last night, a jubilant Anfield atmosphere spurred Liverpool on to a dramatic victory over Borussia Dortmund in the Europa League. This afternoon, the mood was naturally much more sombre, but no less passionate. 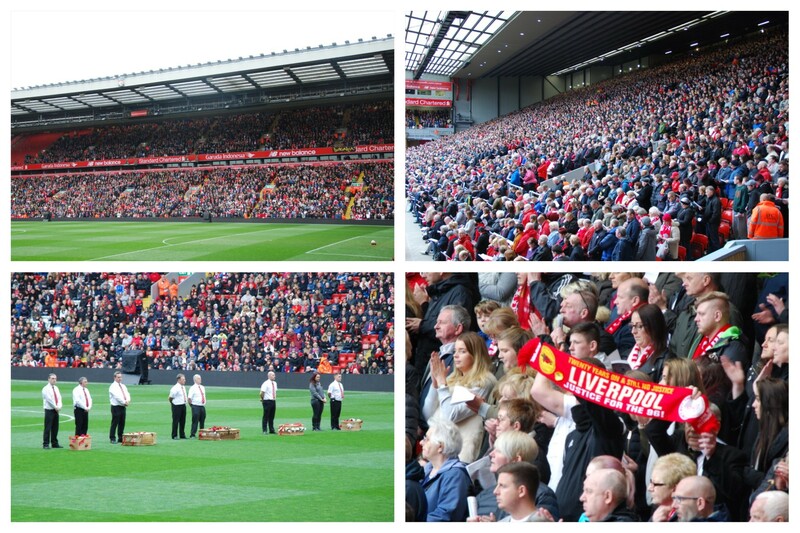 Around 22,000 people filled the Kop and Centenary Stand to pay their respects. 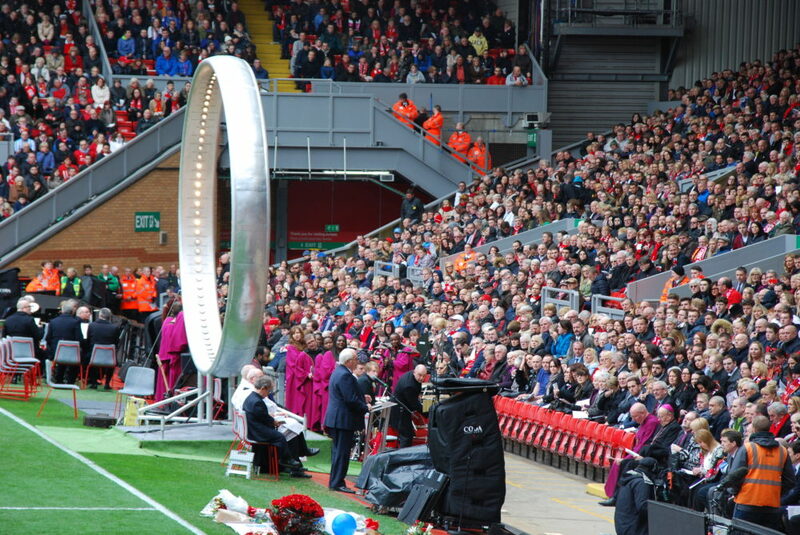 The names of the 96 victims were read out, and also featured on the Band of Life sculpture, before a one minute’s silence was impeccably observed at 3.06pm – the time Liverpool’s tragic FA Cup semi-final against Nottingham Forest was halted in 1989. 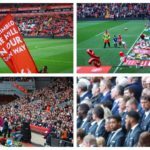 Among those in the crowd were the current Liverpool team manager Jurgen Klopp, ex-bosses Brendan Rodgers and Kenny Dalglish, and club heroes such as Alan Hansen. 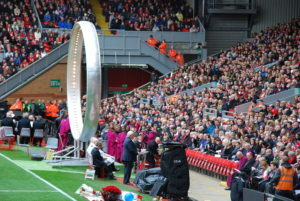 Dalglish, who managed Liverpool on that fateful day, received a thunderous round of applause as he took to the podium to read a passage from St John’s gospel. 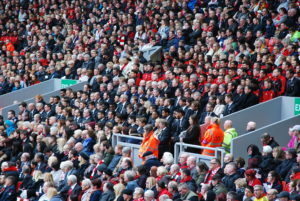 City Mayor Joe Anderson then delivered a heartfelt speech, highlighting the Liverpool fans’ amazing support for the 96, before inviting the crowd to give the Hillsborough families a standing ovation. Chairs of the HFSG, Margaret Aspinall and Trevor Hicks, both stated that the families owe the fans, players and managers a great debt of thanks for their continued backing over the past two decades. Aspinall, whose 18-year-old son James died in the disaster, went on to say: “I’m still angry that you guys, along with us, have had to wait for so long to get to the stage we’re at now. She then encouraged the crowd to stand and join Lee Roy James, the Love and Joy Gospel Choir and The Salvation Army Band sing ‘Wind Beneath My Wings’, as 96 white doves were released in memory of those who passed away 27 years ago. The final memorial service also included readings from Reverend Kevin Bolton, Deacon Flip den Uli, Father Stephen Maloney and Professor Phil Scraton. 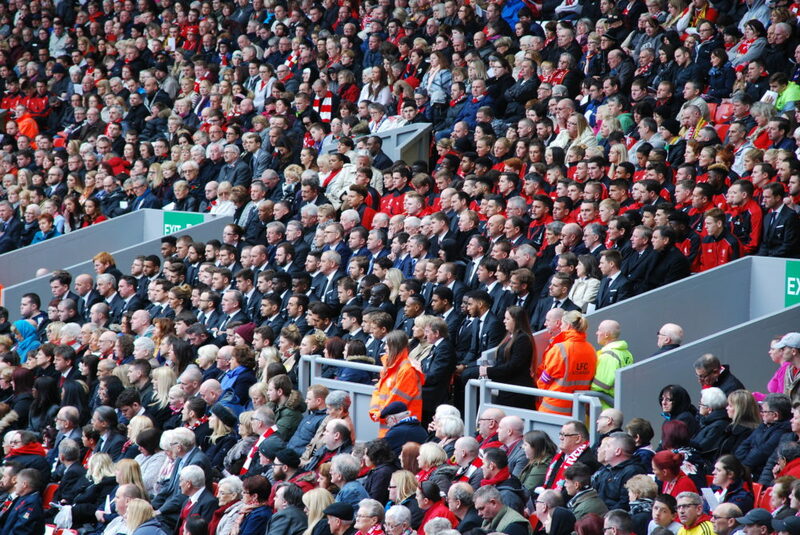 At the opening of the ceremony, Reverend Bolton emphasised how the club’s anthem, ‘You’ll Never Walk Alone’, has typified the unity felt during 27-year struggle for the truth to emerge. 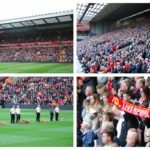 By the end of the service, it appeared that ethos will be demonstrated forevermore, as Anfield reverberated with the sound of the club’s sacred song, before the Kop led the way in demanding justice for the 96.